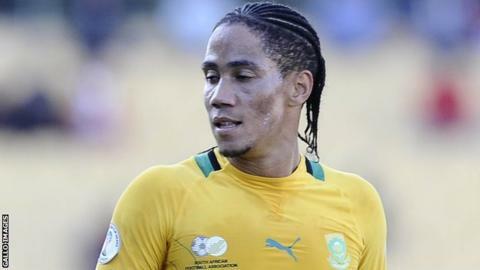 South Africa Football Association chief executive officer Robin Petersen says he still hopes that ex-captain Steven Pienaar will reverse his decision to retire from internationals. Pienaar quit Bafana Bafana on 2 October, three months before they host the 2013 Africa Cup of Nations. Petersen told BBC Sport: "We wish somehow he would change his mind. "I want to sit down with Steven and find out his reasons. We'd love to have him - he's clearly our best player." The 30-year-old has 60 caps for his country and has played in two World Cups, and Petersen is keen to draw on his experience in next year's Nations Cup, which takes place between 19 January and 10 February. "It is a big setback for us. It is very sad," said Petersen. Petersen believes South Africa's poor recent form and the huge responsibility on Pienaar's shoulders were contributing factors in the Everton midfielder's decision. "Steven has been a loyal servant to South African football and he has given his best - I have never been one of those who felt he hasn't tried," said Petersen. "I've always seen him as working hard, carrying a big burden psychologically and emotionally. "We haven't been doing that well and I think it has worn him down - the emotional and psychological pressure, rather than physical pressure, has been the thing that has worn him down. "Maybe he will change his mind in the future, we will see." But as things stand, Petersen is aware that South Africa must plan for life without Pienaar. And he has been quick to praise the response from coach Gordon Igesund. "We have to move on and the coach's attitude has been the right one, which is to say 'we have to make do with what we have'. "And that's what I really like about our coach - he turns those negatives into positives and he sees how he is able to make the most of what we have."